Book Reviews and Promotions: Have You Read Fifty Shades Yet? 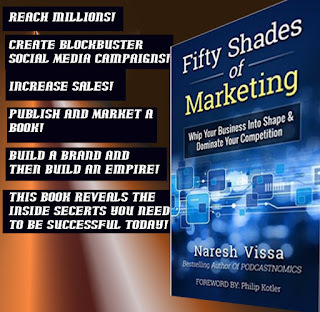 Fifty Shades of Marketing That is! It is a harsh reality, but having a quality product and a friendly and knowledgeable staff just isn't enough anymore. You need to stand out and make a lasting impression on your customers or you will be left with full shelves and empty pockets. We all want the opposite of that. Full pockets and empty shelves equal happy business owners, but how do you get there? Marketing is the golden key to your success and vitality. Did you know that 8 out of every 10 business fail because they do not market their products or services effectively? It is so important that Forbes and Entrepreneur list proper marketing as the top priority for making sales and this is true whether you are selling one small product that you made yourself or if you offer millions of products worldwide. Okay, we understand that you have to advertise to make sales, but how do you do that properly if you have a small budget, you're just starting out or your profit margins are low? You have some options, but like anything else in business, you have to weigh the costs with the benefits. Option A: You can try to wing it and hope and pray that you succeed and that you won't be one of the 8 out of 10 business owners that took that route and failed. Option B: You can hire a professional and you will likely see great sales, but how long until you make a profit after paying his or her salary? A professional will run you about 100 grand a year, can you really afford that? Option C: You can take marketing classes and learn how to do it yourself. For most people this is the best option so far, but you are still investing a least a few hundred dollars and tons of your valuable time and we all know that time is money. What is the real cost of option c? What if there was a better way? What if you could learn the secrets to successful marketing in a short amount of time, with an investment that is less than five dollars? Wouldn't you jump at such an opportunity? Well guess what, Ladies and Gentlemen, you can do just that! For less than the cost of your lunch today, you can learn the secrets of successful marketing and start seeing a dramatic increase in your sales in less time that it would take you to finish one marketing course or conduct two job interviews! 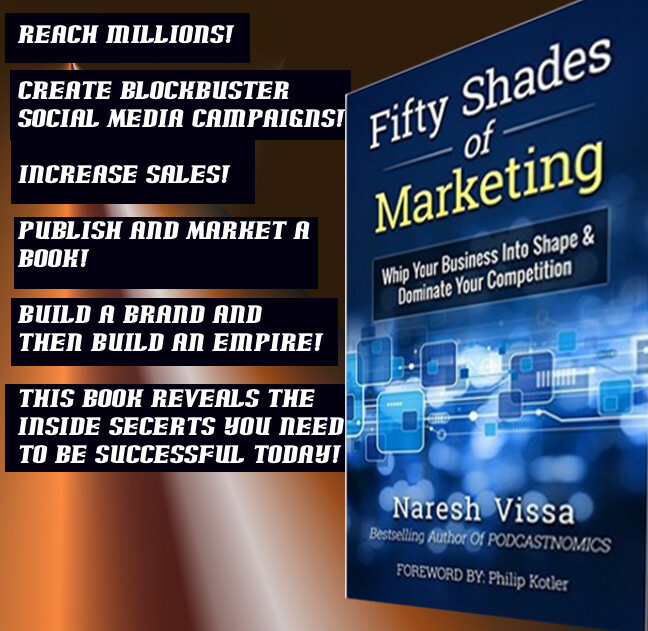 The secrets are right here in Naresh Vissa's innovative new book, Fifty Shades of Marketing. Everything you need to start getting the sale you want is right here and the truth is at such a low price, you will make back the money for your book purchase with your first sale. You have nothing to lose and everything to gain, so grab your copy of Fifty Shades of Marketing today! I know I have your attention already, but just in case you are not convinced to buy your copy right now, please read on and learn more about this life changing book! Billions of people around the world are more connected than ever before. Whether you’re an operating business or college or job applicant, decision-makers need to know about you... what you offer... why you're awesome. Traditional marketing no longer cuts it today. The “father of modern marketing,” Philip Kotler is a leading professor at Northwestern University’s Kellogg School of Management, and he strongly endorses FIFTY SHADES OF MARKETING: Whip Your Business Into Shape & Dominate Your Competition as the most groundbreaking book on personal and business marketing written to date. It lays out specific ideas, step-by-step techniques, and beneficial resources to remove the chains holding you back from success in a digital age. The author, Naresh Vissa, has graciously reduced the price of the book to you so it can be affordable to anyone. You won’t find a book with so much value to be sold for just a few dollars.